"The main strength of Strickland's book is that after the author's introductions, the portraits come from the individuals themselves. Strickland's lead-ins give readers, especially non-Alaskans, a context for understanding the speaker." - Diane Raab, Juneau Empire, November 12, 1992. "A convincing portrait of what Alaska looks like in the eyes of its people." - Debbie Carter, Fairbanks Daily News Miner, November 8, 1992. "This is a book every secondary school library needs to buy to present good role models for young girls. The women here are in-charge kind of people. Homer News, January 21, 1993. "Strickland has already demonstrated a deft touch in his previous Northwest oral histories, River Pigs And Cayuses and Whistlepunks & Geoducks." Seattle Post-Intelligencer, December 17, 1992. 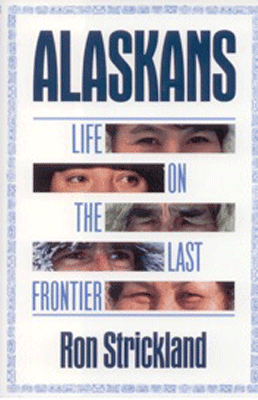 "`Searching for the essence of Alaskan-ness,', writer/outdoorsman Ron Strickland captures a sense of that elusive quality in the myriad personalities he shares in his oral histories." Journal Of The West, January, 1995.